Drones are super cool, and we don’t think anyone reading this will disagree with such a statement. The folks over at fried chicken fast food chain KFC clearly agree, and why wouldn’t they? While that makes plenty of sense, what the company did with its India-only Smoky Grilled Wings might not. See, anyone who bought the wings was apparently able to re-assemble the box and its parts in order to create, believe it or not, a Bluetooth-enabled drone. 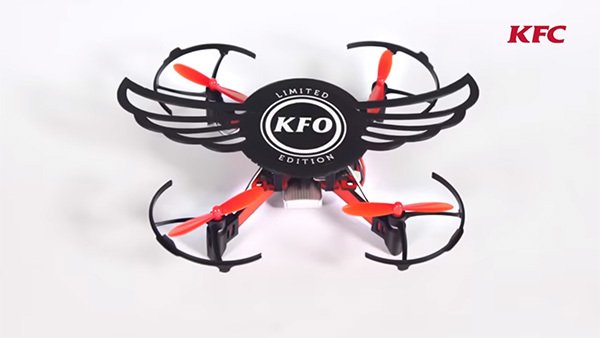 The company, somewhat comically, called the resulting drone a “KFO,” or Kentucky Flying Object, so there’s that to consider. Awful name aside, the whole idea has me torn but I do like chicken, and I do like drones, so I think I’m fine with it. The boxes were apparently available only for limited time. We just wish KFC would make this available outside India, but so be it. This is not the first time a food or drink company has been involved in a strange tech decision. Drink maker Pepsi famously teamed up with its own hardware partners to create the Pepsi P1, an Android smartphone that looked like just about every other Android phone but came with a Pepsi wallpaper and was offered in blue, gold and silver color options. Similarly to the KFO, the phone was only available in one location – that time it was China. Which company will be the next to offer some sort of tech-based tie-in? I want McDonalds to create a Ronald McDonald Sphero-type robot, but I think I may be alone in that! Downgrade iOS 11.2.5 To 11.1.2 For Jailbreak Purposes, Is It Possible?